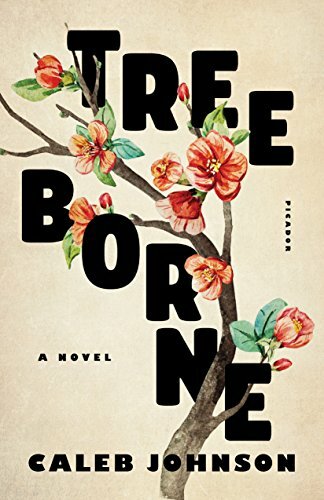 Caleb Johnson’s debut, Treeborne, is a story about a family living in Elberta, Alabama, where a parcel of land, 700 acres in total, arouses deep emotions as it’s about to be flooded over when the 80-year-old Hernando De Soto dam is scheduled for destruction. Familial secrets are spilled as main narrator Janie Treeborne and others begin to recount what it means to live on The Seven, to confront what it means to be a Treeborne. As the story is relayed, conquistadors once brought and planted peach trees, and the fruit and its many agricultural benefits including vocations, peach centered celebrations, and the simple enjoyment of eating, are scattered throughout the story for added setting and texture. Hardships seems synonymous with the Treeborne name, from present day Janie’s refusal to leave the land she’s fought for her entire life despite the coming water, to her grandfather Hugh’s sculptures found by a Northerner who then takes credit for them, and on to her Aunt Tammy’s cutting of the precious trees on The Seven, prompting a younger Janie to formulate a mismanaged plan resulting in unforeseen circumstances that get out of hand. “Foot yes, I do,” she said. Evoking Cormac McCarthy, Johnson strings also words together, like britchesleg and orchardfield. He is deft with the dialect of the south, bringing out realistic speech patterns that also give authenticity to the dialogue. This story of the inhabitants of Elberta, and those of the Treeborne clan, consists of many different and connected parts, and the author leaves it to the reader to become acquainted to the best of their ability; some may find this confusing. While Janie Treeborne is the main narrator, several timeframes are presented as well as other family and other key individuals' viewpoints in the third person, and the story moves from present day to 1958, 1929, 1930, back to present day, and so on. There is a quirky and strange relationship with an inanimate object, Janie Treeborne’s doll, an interesting yet puzzling aspect of the story. Handmade and referenced as “dirt boy,” as well as “Crusoe,” the doll was created by her artistic grandfather. The first time the doll is mentioned, Janie speaks of it as if it is a real person. Crusoe does things on his own, like building a fire, conversing, walking, thinking, seeing—doing what any human would do. These could be the mystical manifestations of the human mind once it encounters personal tragedy, pain, and loss, as all the Treebornes suffer, yet it lends a peculiar quality to the story. All in all, Treeborne is a certainly a one of kind story, and readers will have to determine for themselves what to make of this distinctively different and thought provoking southern fiction novel.